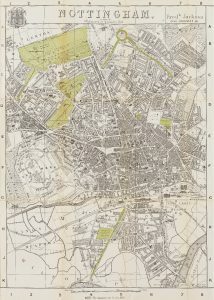 In the early 19th century, Nottingham was a physically small but densely populated town; it is estimated that in 1850, 57,000 people lived in an area that measured approximately one mile west to east and 3/4 mile north to south. Many of the townspeople lived in houses which lacked basic sanitation or running water. Unsurprisingly, the mortality rate was high. 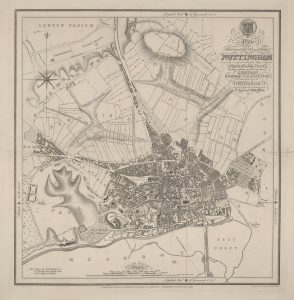 Although Nottingham was surrounded by 1,442 acres of farmland, it was not possible to build on it because the town’s burgesses held traditional rights and resisted attempts to develop the land for housing. Additionally, for many years it was considered that the healthy fresh air of the surrounding fields counteracted the unhealthy smoke in the town centre. It was only after Thomas Hawksley, a Nottingham-born civil engineer, showed how the overcrowded conditions led to disease and death, that attitudes began to change. 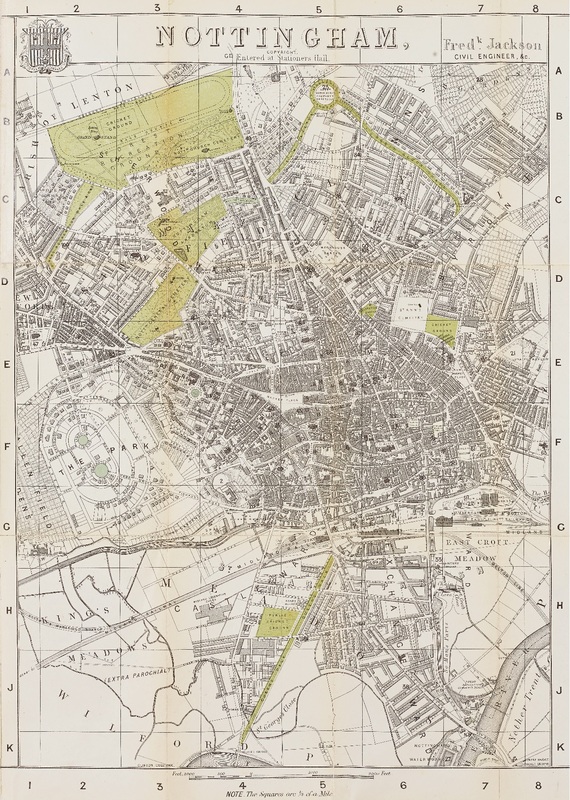 In 1845, after over 50 years of argument, the Nottingham Enclosure Act freed the land for building. The Act also ensured that approximately 130 acres of land was set aside to provide open space for the health and recreation of the townspeople. These spaces are providing the same service to Nottingham people to this day. [Click to enlarge] Plan of Nottingham by Staveley and Wood, showing the densely populated town surrounded by open fields, 1831.
of the expanding town, c1882.